The hubby and I are trying to make more time in our lives to do something fun together, at least once a week. It feels like between work, the coffee shop, our duplex and tenants and trying to keep our lives semi organized, there isn't much time for dates anymore. For people who genuinely like spending time together this is difficult, so spending more time together is definitely top of the priority list. While I was finishing up laundry my sweet hubby came home with dinner and a movie. 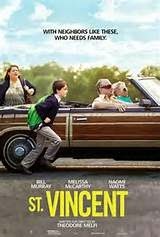 He rented us St. Vincent because he knows I am a HUGE Melissa McCarthy fan. Now, that being said, I am not a Bill Murray fan in any sense of the word (sorry to those of you out there who are!) so I was not really expecting to like the movie. OMG, if you have not seen this movie go out right away and rent it. Hell, buy it even. This was one of the funniest, sweetest movies I have seen in a long time. You will laugh, and if you are as sappy as I am, you will most definitely cry. Even for someone who does not like Bill Murray, really can't even stand to hear him talk, I have to admit he did a great job. Seriously, do yourself a favor, get together with some friends or your significant other, and make a fun night of it. Oh Kim, we both must have great tastes in movies. My husband and I just watched this last weekend. It was amazing, I neeeded two Kleenex! I am a huge Melissa M. Fan too and I really liked her more subtle performance. Heck, she can do anything and I'd love it! Love ya girl!